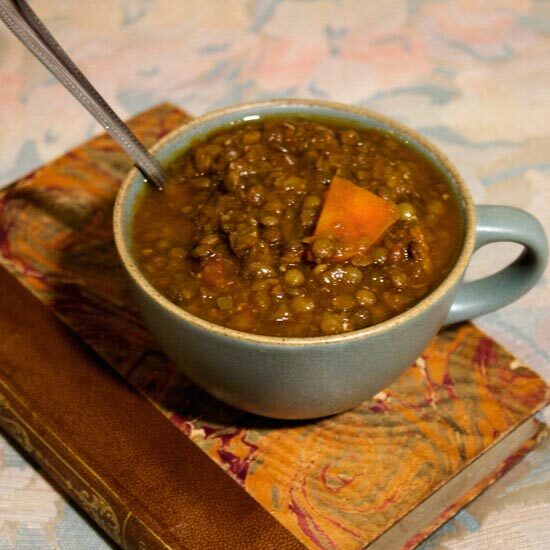 This is a very hearty vegan soup, very filling and nutritious and just what you want on a cold winter’s evening. Have some in a comfy chair by a good roaring fire – or a heater, whatever you’ve got. Enjoy it. 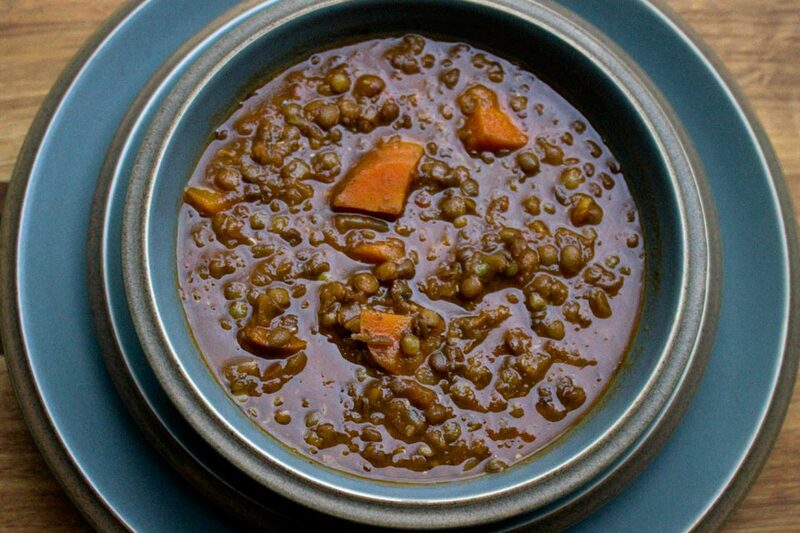 This a yummy and comforting vegan soup. I found this recipe on a food blog called Honest Fare (link below). The original recipe used Worcestershire sauce which has anchovies in its ingredients, so it’s not even vegetarian nevermind vegan. I didn’t realise this when I first posted the recipe but as it happened I was using a vegan version of Worcestershire sauce anyway called Worcester sauce. I don’t think it’s as spicy as the original and there is a vegan sauce called Hot Pepper Sauce that is good at adding a kick to dishes, so if you’re looking for a kick add a bit of this to the soup after it has cooked. A warming and nutritious bowl of goodness. And it’s vegan. This soup is yummy. It tastes like lying on the sofa with a good book with the fire on or wrapped in a cozy blanket or both. I think that’s what they call “umami”. This soup has umami in spades. I found this recipe on Honest Fare. I didn’t have any miso paste so I just left that out, I also added more paprika, used tinned whole plum tomatoes and added some dillisk. I also used all dried herbs and didn’t make a herb packet. If you’ve read other recipes here you may have noticed that I usually use dried herbs. This is not because I think dried herbs are better, fresh herbs have a sweetness and a vibrancy that you cannot get with dried, and from a nutritional standpoint fresh are better, but dried herbs have some nutritional value too and more importantly they have such a long shelf-life, usually 1 – 2 years, and I hate to see fresh herbs that I haven’t got around to using withering away. If I had a herb garden I’d always use fresh herbs but I don’t so for normal everyday cooking I use dried herbs. I use more fresh herbs these days because they now sell them in packets – I hate buying the plants and they end up dying on me. 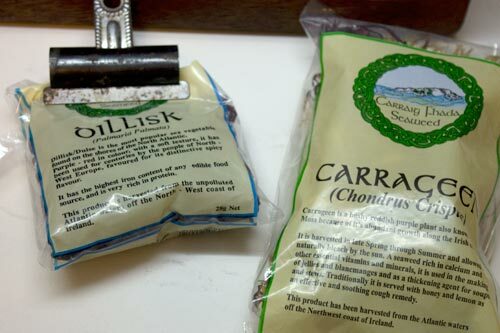 Dillisk and Carrageen – I bought them from a local supermarket during the summer but I haven’t been able to figure out just what to do with them… Seaweeds are usually full of nutrients so I will be trying them out in things every now and then. The reason why I added the dillisk was purely for the goodness you get from it. Dillisk is rich in iron, potassium, zinc, manganese and it also contains calcium. I wasn’t really sure how it was going to affect the taste of the soup. I added it with the water, so quite early on, and to begin with I wasn’t crazy about how it was tasting but after it simmering away with the soup for 30 minutes or so, it actually add this slight background to the saltiness in the soup which was very pleasant. I just read this article 11 foods a vegan should include and it says that vegans shouldn’t rely on just seaweed to meet your vitamin B12 requirements, you need to have foods that are fortified with B12 or use supplement. Vitamin B12 is essential for your health. 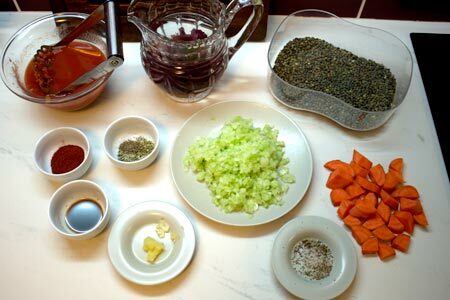 Tinned tomatoes, puy lentils, onion, celery, carrot, paprika, tarragon, thyme, oregano, worcestershire sauce, garlic, water, dillisk, salt and pepper – altogether make a very yummy soup. Heat a little oil in a deep saucepan. Add the onions, celery, carrot, salt and pepper and stir in well. Cover the pan and leave to cook on a gentle-moderate heat for 2 minutes. Add the paprika, stir in well, cover and leave for another 5 minutes. Add in the mashed up tomatoes, tarragon, oregano, thyme, garlic and worcester sauce. Stir in well, cover and leave for another 5 minutes. Add in the lentils, water and dillisk. Turn up the heat and bring to boil and boil on full heat for 5 minutes. 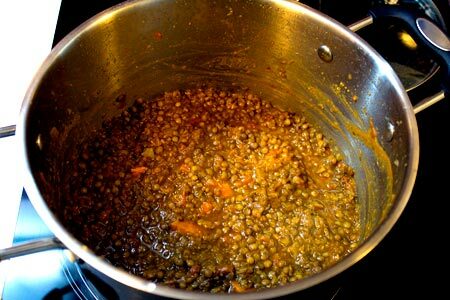 Reduce heat to gentle-moderate and leave to simmer for about 30 minutes or until the lentils are tender. Taste and add more seasoning. If you want to add more of a kick to it add in some Hot Pepper sauce. I puréed half of the soup and then re-added the other half to the pot. It’s not really necessary but if you’re looking for more of a stew than a soup it will thicken the dish a lot.